Woodwind Solo. Composed by Antonio Vivaldi (1678-1741). 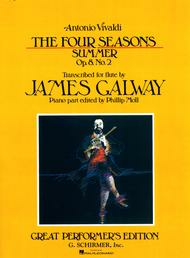 Edited by James Galway. Great Performer's Edition. Classical. Set of parts. 28 pages. G. Schirmer #ED3592. Published by G. Schirmer (HL.50506760). , and I am very grateful to James Galway.